Supporters of Narendra Modi and the BJP gather at a rally. India's stock market surged Friday after early election results suggested a sweeping victory for Narendra Modi and the pro-business Bharatiya Janata Party. Investors reacted to the news with enthusiasm, and Mumbai's Sensex index advanced by more than 5% in early trading before paring gains to close 0.4% higher. The rupee strengthened by more than 1% and hit a new 10-month high against the dollar. The prospect of a Modi-led government has helped boost India stocks by almost 13% since the start of the year. The rupee has responded too, clawing its way back from a dismal performance in 2013. 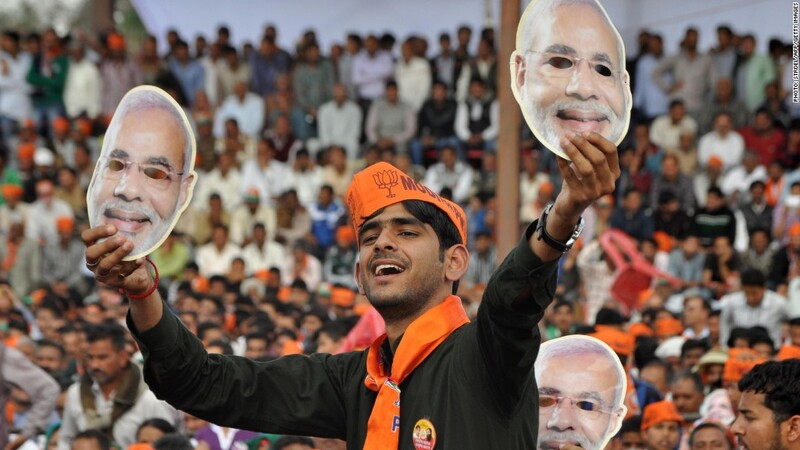 The initial results indicate that Modi is on track to be India's next prime minister. While the final vote tallies have not been released, the BJP could capture more than 272 seats, the threshold required to secure a majority in the lower house of parliament. A jubilant BJP described the result as a turning point for Asia's third largest economy. "Till some time ago, it was said India's success story is over. Now, the time has come to rewrite India's success story," party chief Rajnath Singh told reporters. Exit polls released early this week suggested that India's 815 million eligible voters had supported the BJP in large numbers, but observers expressed surprise Friday at the extent of the party's apparent dominance over rivals including the Congress Party. Congress Party spokesman Randeep Surjewala conceded that his party was headed for defeat and that "trends indicate a victory for the opposition alliance." Investors are hopeful that Modi will implement long awaited economic reforms, but others are wary of his fractious relationship with India's Muslim community. India's potential for growth was once mentioned in the same breath as that of China. But the world's second most populous nation and biggest democracy has failed to deliver and its economy is just a fifth the size of its Asian rival. Economic growth has fallen below 5% in recent quarters, its lowest level in years. The currency has lost more than a third of its value since 2011. Observers don't expect much improvement this year, a troubling sign for one of the world's top 10 economies. Analysts say India would benefit greatly from changes to its tax code, a reduction in excessive bureaucracy and more efficient agricultural policies. Momentum on these reforms stalled under the leadership of the Congress Party. Modi has presented himself as a candidate in the mold of a CEO, campaigning on his record of fostering low unemployment and high foreign investment as head of Gujarat state. Investors are hoping that he will be able to conjure some of the same magic on a bigger stage. "The BJP victory is likely to herald a revival in India's economic fortunes, with the potential to boost Indian GDP growth back over 8% by 2017," said Rajiv Biswas, an economist at IHS Global Insight. Others think it likely that Modi's agenda will fall victim to India's fractious legislative process. The Congress Party could still obstruct reforms in the upper house. "Dynamics in the upper house, where the state and regional parties provide swing votes, will now be a key variable determining the advancement of the new government's reform agenda," wrote analysts at Eurasia Group. Many observers have also expressed concern over Modi's association with Hindu nationalist causes -- a potentially destabilizing agenda. Much of the criticism centers on his handling of riots between Muslims and Hindus in 2002 that resulted in the deaths of 2,000 people. Modi was accused of not responding quickly or adequately to the tumult, but he has denied any responsibility. --CNNMoney's Mark Thompson in London and CNN's Harmeet Singh in New Delhi contributed to this article.